We provide our services to leagues that include hundreds of teams as well as to individual team parents or managers. Looking for a better choice in photography, we are the answer! o Our photographers shoot a combined total of over 2,000,000 sports photographs each year. o Our phone number and website are clearly displayed on all of our literature. Additionally, our lab is staffed 7 days a week to answer calls. We proudly offer a 100% satisfaction guarantee. o Uniformed staff, banners, displays, temporary fencing, and courtesy tables keep Photo Day running smoothly and show that your league uses a true professional photography company! o YSPN will schedule Photo Day based on your needs and what is convenient for your teams. o Our Pricing is among the lowest in the industry. Don’t be fooled by a start-up company with unbelievable prices. Many close up shop before fulfilling your leagues orders, leaving your participants empty handed. o Being the lab gives us complete control over quality and turnaround time. Our photographs are chemically processed on Kodak® paper to ensure the highest quality, and archival life. o Easy online re-ordering is avalible. No more order slips to fill out or snail mail to lose. o From Photos to Mouse Pads to Photo Balls. Please visit our "Products" page to for a complete listing of specialty items. Are you interested in a better option for your Team & Individual services? 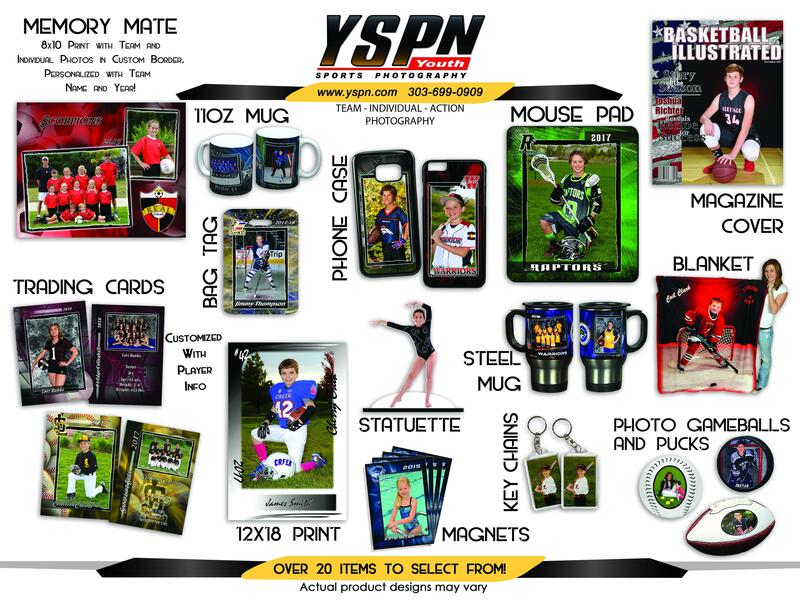 Contact us to learn more about how YSPN can increase your customer satisfaction and assist in fundraising for your league. We currently work with large sports organizations and recreation centers as well as a variety of smaller leagues, providing excellent products and industry leading turnaround times. YSPN can have one of our many photographers come to your practice or Game at no charge to take Team and Individual photos. Just call us at 303-699-0909 or email info@yspn.com to schedule an appointment.